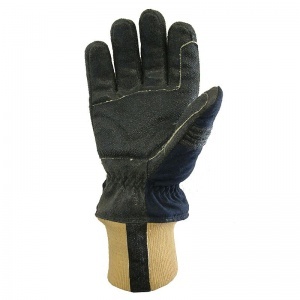 When it comes to firefighting gloves, cutting corners is simply not an option. That's why the Southcombe Firemaster Alpha Gloves SB02683A are built to last, with high levels of comfort coupled with protection from fire, abrasions, cuts and more. Featuring a curved, fully fitted finger design, these gloves are made entirely from aramid fibres for those who want the best protection and dexterity available without the use of leather. These gloves have been designed to stand up to all the obstacles faced in the day to day life of a firefighter. Offering a high degree of protection, along with excellent levels of protection, there are few situations these gloves aren't suited to. In particular, the Firemaster Alpha Gloves are perfect for structural firefighting duties as well as technical rescue operations, extrications and training exercises. These gloves use some of the best materials available to help them stand out from the crowd in terms of both comfort and safety. These fire gloves feature curved fingers and box-end fingertips with thumb and knuckle articulations to enhance comfort on the job while providing exceptional levels of dexterity. For extra protection, the outer shell is made from a flame retardant, silicone-coated Kevlar fabric on the palm for abrasion resistance and grip and a Nomex fabric on the back of the hand with felted Kevlar. For a secure fit, these gloves feature a knitted Kevlar wristlet cuff, providing a perfect fit around the wrist and compatibility with tunic sleeves. This intelligently designed cuff also prevents the ingress of debris, boosting protection and comfort. A seam-sealed moisture vapour permeable membrane guarantees that these gloves are waterproof, while also breathable to prevent overheating. For full hand protection, the cut and sew lining is made with Kevlar, ensuring superior safety and peace of mind for the wearer. Since firefighters deal with a range of hazards on the job, these gloves protect against more than just fire and heat. 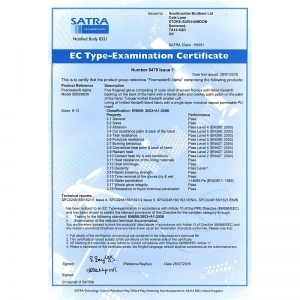 The Southcombe Firemaster Alpha Gloves SB02683A have been rigorously tested to stand up to the following hazards. 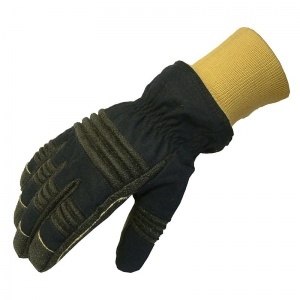 These gloves are available in a range of sizes to suit different users. To determine the right size for you, measure around the widest part of your dominant hand between your thumb and index finger and make a loose fist.